The masks have now ‘fallen off’ and truly in Spirit energetically, and so in linking with the human, this will no longer suffice to cope and manage! This is so very huge! I am talking energetically in the last 24hours and from recent energies leading up to this, please refer past posts – Pts 1-4. The message is: ‘Just be you, your energy power and strength is enough..no need to over exert your energy anymore. As it is not sufficing energetically now’. A lot has happened since the last BB post, so much so that sharing about this has not happened as I usually do, as each of us has needed to be in our own spaces going through all we have/are needing to. So much is going on with self and family or those close with us and our connections and our own connection. We are Creating a *NEW* Light path and like ‘stepping off the old black tar sticky path’. The new ‘unknown’ territory that we are creating moment by moment in each new situation with all we have gone through (remember previous BB posts are a time-line leading up to this post). So much of the Ancient/Ancestry energy is being healed and with this is the human experience and then also our Spirits experience and then linking the two with a connection to the Divine and Gaia as well. Fear of stepping into one’s own Power or Self-Empowerment in the human as well as spirit and linking the two is so very BIG right now. As so many have detached or drifted off into the upper realms, I know I did for many years, stemming from childhood. To cope and manage and at a time where there was no understanding of energies and who I was and all I needed to endure through personal experiences to bring me to who and where I am right now. As just like you too…with all you have endured and experienced up until right now, this very moment. As we detached and/or put a ‘mask’ on to cope. Well those ‘masks’ have energetically fallen off in Spirit and the truth is being revealed as to what is going on within and deeper within ourselves! We are now facing our Inner Fear of owning our own Power! Gregg Prescott wrote of this not long ago: “What we’re going to see are people losing it and it wouldn’t surprise me to see some people in the spiritual community lose it who haven’t done their work and/or are not grounding themselves”. The inner truth of coming home to our power. Where we do not over ride others energies…as a lot is to do with past ‘wars’ where we needed to ‘fight for our survival’. This is about bringing our strength, confidence and belief in ourselves. And very very importantly GROUNDING ONESELF IN OVER AND OVER is VITAL with this. Thank you Gregg for your ‘heads up’ with this :-). As this post follows on deeper/higher energetically with this in our Spirit and the human, and our link with the Divine and Gaia. There is so much more to this for each of us for we we are each at…and I will share more on this soon as it comes. 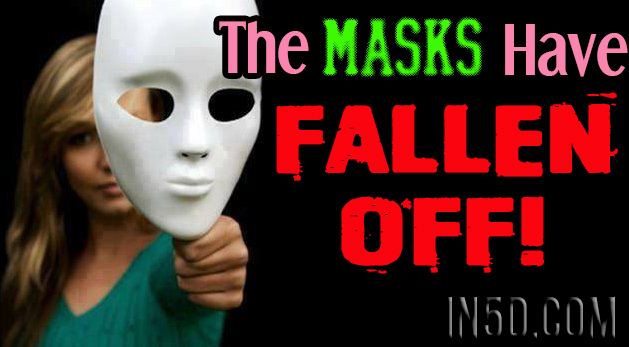 Tags: Energy Update, ENERGY UPDATE - The Masks Have Fallen Off!, The Masks Have Fallen Off!